Men of Bonhoeffer strive to persevere in righteousness, grow in integrity, live and die with conviction and serve with courage, steadfastly upholding a Christ-like community dedicated to these ideals. The House of Bonhoeffer is about excellence and community. Throughout the past ten years, men of Bonhoeffer have risen to prominence as men of achievement; founding clubs, leading the school, and serving throughout New York. But the individuals of Bonhoeffer are not merely known for their achievements. The men of Bonhoeffer remain outstanding individuals, marked by their pursuance of life together. The House of Bonhoeffer is a community where individuals of integrity can pursue life together; a community which strives to emulate the devotion to God seen in Dietrich Bonhoeffer; a community comprised of excellent writers, entrepreneurs, future statesmen, journalists, philosophers, filmmakers, policy analysts, philanthropists, and more. “I love the House on Bonhoeffer, because of the men who gave me greater perspective. Coming to NYC, I had very few answers for my future and was in need of wisdom of those who went before me. In my house, the upperclassmen took the time to show me how to succeed in school, gave me opportunities in work, and mentored me on how to be a more confident leader. For this, I love the House of Bonhoeffer.” James Bentson, ‘16. “The House of Bonhoeffer isn’t simply a group of college guys who have to deal with each other; we’re a tightly-knit group of men who strive to help each other out in all realms of life. Personally, I’ve learned to love myself for who I am because of the support that my Bonhoeffer brothers have given me. Just imagining going through my college experience without the support and love of these men depresses and scares me.” Fermin Villalpando, ‘17. Seven decades after his execution for his role in a plot to assassinate Nazi leader Adolf Hitler, theologian Dietrich Bonhoeffer continues to inspire Christians and others around the world with his message of spirituality and faith. Bonhoeffer, who joined his brother-in-law Hans von Dohnanyi in a resistance group led by Maj. Gen. Hans Oster, was hanged April 9, 1945, at the Flossenbürg concentration camp, weeks before World War II formally ended. He had been linked to the failed attack on Hitler that took place July 20, 1944, by documents the Gestapo found after the event. Ironically, Bonhoeffer was in prison at the time, following his arrest for “undermining the military” 14 months earlier. A paradox of Bonhoeffer’s life is that he had an “out” from being involved in a Germany ruled by National Socialism. In 1939, as war broke out in Europe, Bonhoeffer was a student at Union Theological Seminary in New York City. He could have remained in the United States, but told his American friends, “I must live through this difficult period of our national history with the Christian people of Germany,” according to the Minneapolis Star-Tribune. What Was the “German Character Flaw” During World War II? A destructive myth haunts World War II. It is that a flaw within the German character allowed the rise of Hitler and Nazism. How else can you explain the Holocaust coming from one of the world’s most cultured nations? Oddly, no one seems to consider Mussolini to indicate a flaw within Italians or view Stalin as proof of a Russian defect. The ‘German character flaw’ is a destructive myth because it deflects attention from the crucial task of analyzing the dynamics that allowed Nazism to rise. It permits other nations to believe “it could never happen here.” But totalitarianism can happen anywhere, to any nationality. Understanding the evolution of totalitarianism involves institutional analysis, especially of the interrelation between institutions that were active or complicit in creating tyranny. No man spoke more eloquently on behalf of the civil liberties of Jews than the Protestant pastor and theologian Dietrich Bonhoeffer. He became a prominent voice in ‘the Confessing Church’ that was founded when approximately 3,000 Protestant pastors broke off from the main religious body in protest. (Konfession is German for denomination.) Bonhoeffer reminds us that there are people of conscience and moral courage in every nation. He is also a window into the institutional dynamics of church and state that both facilitated and hindered Hitler. Are We Willing to Be Interrupted by God? Friedrich Bonhoeffer’s wife Julie (Dietrich Bonhoeffer’s Grandmother) was the direct link between a long history and Dietrich Bonhoeffer’s life. Born on 21 August 1842, she could talk about the days of Eduard Mörike and Justinus Kerner. But it was just as characteristic of her that, at the age of ninety-one, she marched past the S.A. (Nazi Storm Troppers) cordons promoting the boycott of Jewish businesses on 1 April 1933, to shop at the Jewish-owned “Kaufhaus des Westens” on Tauentzienstrasse in Berlin. ~ Eberhard Bethge, Dietrich Bonhoeffer: A Biography (Revised Edition); Chapter 1: Childhood and Youth: 1906-1923, 10-11. (Photos: Facebook/Fresh Fire USA)Todd Bentley, healing evangelist and founder of Fresh Fire USA (L) and his wife Jessa (R). “My wife does not know that I’m doing this. How about that everybody,” he said with a chuckle in a Periscope Live broadcast. “If you did not know that it was my wife Jessa Bentley’s birthday and you’re a personal friend, on Facebook or you just happen to know us, stop by my wife’s Facebook and wish her a happy birthday. I posted a beautiful picture of my wife Jessa on my Facebook,” he continued. He then explained he was doing a “surprise” for Jessa and that a lot of her friends would be a part of it before explaining to his “friends” on social media how they could be a part of it too. “I know we like to get on here and we talk about a lot of ministry stuff. You know we talk about feeding kids in Malawi, we talk about Pakistan, sometimes we don’t even talk about anything. But I want to talk about how to bless my wife Jessa Bentley and this is for friends and this for those who would like the chance to bless not just the message but the messenger,” he said. Bentley explained that he wasn’t asking out of need because “definitely it’s not because we need the money.” His ministry, he said, has been very blessed already. He said he was simply giving his friends and fans an opportunity to bless and honor his wife beyond a “happy birthday” note on social media. Neither book intends to answer all of the questions definitively, but together they are like maps for Christians in the complex and confusing intersection of the Bible and science. We cannot bury our head in the sand, or outsource study of these issues to others. Ted Cabal and Peter Rasor help us sort through the issues and the options, modeling for us how to use proportion and perspective in our rhetoric and strategies of disagreement within the body of Christ. We live in perplexing days, but clear and clarifying books like this are a tremendous gift to the church. If the arguments and tone of this book are taken to heart, we will all be sharper, wiser, and kinder. I pray it is widely read. 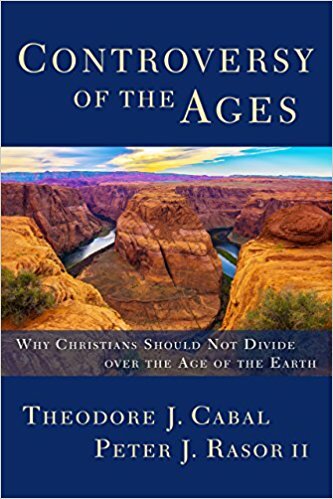 When people ask for a good book to read about the age of the earth, I have a new favorite to recommend: Cabal and Rasor’s Controversy of the Ages. With remarkable clarity, this book provides historical and theological context to the young-earth/old-earth controversy. But Cabal and Rasor move beyond mere description and prescribe the way to move forward—the Galileo approach. This is an important book, and it needs to be read by pastors, college and seminary students, and all who care about science and faith issues. “In addition to a well-informed history of evangelical moves for relating Genesis to geology and then to Darwinism, the authors have given us much more. They have provided trenchant evaluation of the argumentative strategies―theological, scientific, and philosophical. They show that of the various groups known to us today―the young earth creationists, the (non-Darwinian) old earth creationists, and the evolutionary creationists―none can be exempted from critique, and none deserves the place of exclusive privilege. This book deserves a wide readership, for it is informative, fair, and incisive. I rejoice that God spared Dr. Cabal from a terminal cancer to help write this! Americans today might do well to heed Bonhoeffer’s warning. Although he was in power for only a handful of years, Hitler and his Nazi government slaughtered millions. One of the more well-known victims of that slaughter was Dietrich Bonhoeffer, who was executed on April 9th, 1945, a few short weeks before Hitler’s own death. Unlike many of Hitler’s victims, Bonhoeffer was not a Jew, but a Lutheran minister, scholar, and theologian who boldly spoke against Hitler’s policies. Bonhoeffer landed a position in the German government during WWII and subsequently used that position as cover for assassination attempts against Hitler.